Two weeks ago, there was a devastating building collapse in the Achrafieh neighborhood of Fasouh. The tragedy was naturally widely-covered by various media outlets who made a big fuss about the whole event. It was one of those events that leave you numb for a few days and you stare blankly at the TV as reports come in. I was left with almost the same dumb shock emotion as I did during the 9/11 attacks a while back. I felt the same anger at those responsible for keeping a clearly unstable building up, the same sadness for the loss of lives and the pain the families are enduring, the same frustration that this had to happen in the first place and the same helplessness of not knowing what to do to help. Today I passed by the site with a few friends who were photographing in the area. It wasn’t really planned that we would visit the site (and I didn't really feel comfortable visiting it before), but a curiosity of wanting to see it for ourselves drew us closer. It kind of makes it more real when you see things in front of you. I was a bit hesitant to share the photographs I took there today, but I believe what remains of such tragedies also reveals a lot – both about the incident itself and those who once called this now-flattened plot of land their home. And you’re left, as an outsider, with only little clues of what their lives were like before. A silent echo of mourning can be felt so deeply while visiting the site. You can’t help but feel something stir inside of you. Text and photographs by Loryne Atoui. Loryne is a designer and aspiring photojournalist who shares stories through her camera on her photoblog. 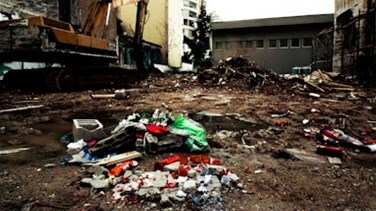 She's also the founder and president of the active Beirut Street Photographers (BSP) community.